We have friends in New England (Boston) who always treat us like family. Recently we visited them and I was surprised at how different the area looked compared to when we last saw them during the fall season. The landscape of red and yellow autumn leaves is a sight that I will never forget. During the summer the area looks lush and green like Hawaii. 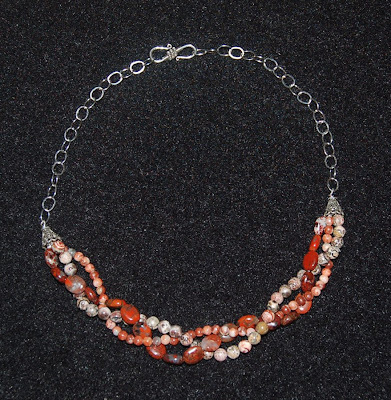 I wanted to make a simple necklace for Maureen as a thank you for being well......Maureen, so I looked through my bead stash and located three strands of autumn red beads....perfect. The bead strands were from the Imagine It line available at Ben Franklin Crafts. Because the strands are 8 inches I usually use them for bracelets or combine a couple of strands into a necklace. This time I put three assorted bead strands in the front and covered the ends with cones and connected the cones with a chain. It was a very simple project and could easily be adapted to whatever three strands suit your fancy. I will publish the instructions on the craft club website (http://www.bfcraftclub.com/). Oh I just discovered the followers symbol that tells me that someone is looking at my blog site. I don't know if I am supposed to do something. I wonder if other bloggers have left their names and being dense I didn't realize I was supposed to respond. Please excuse me if I seem rude but I am really just technically challenged. I am still trying to put up a profile and change my banner. Every once in awhile I try to leave a comment but I'm only successful some of the time and I don't know what I am doing wrong. Please be patient.....I'll figure it all out one day. 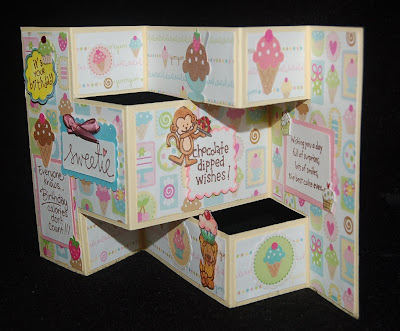 While surfing around and reading craft blogs, I came across instructions for making the base for this 3-D card. I've seen this kind of card before but it always looked too complicated. The writer of this particular blog had a good tutorial for making the card so I decided to try it. (The writer of the blog admits she learned how to do it from someone else's blog so I guess it's okay if I pass it on.) Anyway, the card turned out to be really easy to make. (The project will be on our website (http://www.bfcraftclub.com/) next week.) On the card the monkey, dog, and 'chocolate dipped wishes' are rubber stamp images from Dandelion Designs. The paper, cupcake brad, and most of the stickers are from Doodlebug Designs. Both the Sweetie and Wishing you a.............. words are Hero Art stamps. The Everyone Knows...... rubber stamp is cling rubber from Stampendous. 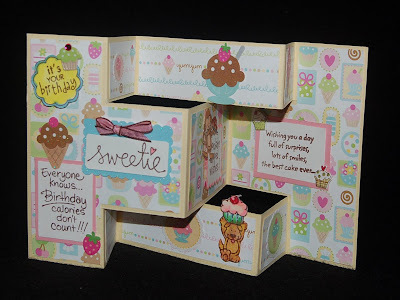 There are lots of companies making paper and embellishments with the sweet dessert theme; so once you master cutting the card base, you should easily be able to sweeten up your card into a delicious no-calorie confectionery treat. Thanks for viewing my blog. Come back soon! 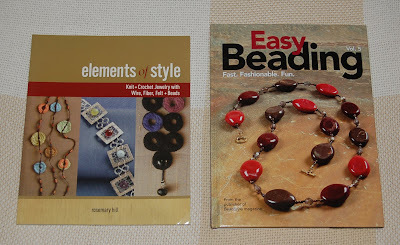 From the amount of books and magazines about beading for sale, it seems that jewelry making continues to be an area of interest to crafters. Recently I purchased several magazines and books that I thought those of you reading this blog may find informative. Creative Jewelry and Wire Jewelry are two recent publications which contain a wealth of new designs and techniques for even a long time jewelry maker like me. Stampington and Company publishes a variety of crafting magazines with an artistic, somewhat funky look. I particularly like their Handcrafted issues because it contains innovative crafts with detailed instructions. I am constantly inspired by the high quality of the projects even the ones done in media with which I am not familiar. Two books that I bought last night would make a good addition to your craft library too. Easy Beading vol. 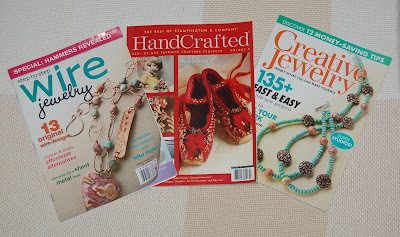 5 is a collection of projects from the BeadStyle magazines. I sometimes miss an issue of their monthly magazine so this book is a good way to catch up and keep many good jewelry projects (with photos and instructions) all in one volume. The second book I purchased titled, Elements of Style, is a rather unique jewelry book. It contains mixed media beading projects involving crocheting and knitting with wire, fiber, and other surprising materials. Whether you locate and read these books or not, be sure that you continue to read about your favorite crafts and learn something new everyday. The Pie Die is Nice, But Give Me Cake! Guess what I used my 40% off coupon for at Ben Franklin Crafts? Yup, I got the pie box Sizzix die cutter. I really think that it looks more like a piece of cake than pie, so I decorated the box to look like a yummy piece of birthday cake. For the fluffy part of the frosting I glued on silk hydrangea petals that I pulled off an old artificial stalk. Other flowers could be used such as some from the BFC wedding department or some made from Hearty Clay. I used white ART glitter glue and Martha Stewart white marble glitter for the top frosting. Printed border adhesive strip pad (DCVW) is a good source of paper that is pretty, fits the Sizzlet strip die cutters perfectly, and already has an adhesive backing. 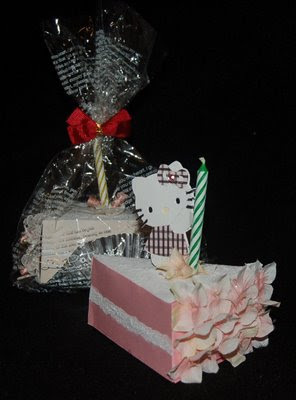 My favorite part of the project is the Sizzlet Hello Kitty (she was holding a balloon) holding a real birthday candle. The Fabri-Tac glue works well on this project because it is thick and bonds quickly. It might be nice to fill the box with triangular note cards or maybe use it as a party favor with candy and form a whole cake using several boxes in the center of the table. The cello bag in the background of the picture shows how you could use a foil baking cup and clear packaging to wrap the cake box for individual gift presentation. Okay, this is a test. How often do Regina and Carin look at this blog? I made earrings as gifts for our craft club staff who kept the office running while we were on vacation, and I've decided that the first one to see these earrings gets to choose the one she wants. The largest bead on each earring was purchased from a small bead shop that sold mostly ceramic beads. These beads which look and feel like polymer clay beads are supposedly from Greece. 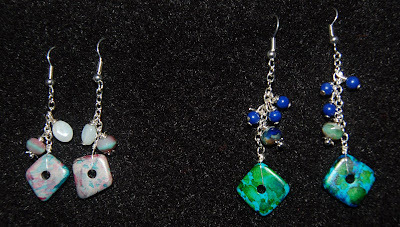 I think that if you want to make earrings like these you could easily make the main beads from polymer clay. The smaller glass beads and the semi-precious ones are from the Ben Franklin Crafts bead department as are the silver plated findings. I'll be waiting for a comment from Carin or Regina.....who will be the first to pick her gift? Wow! 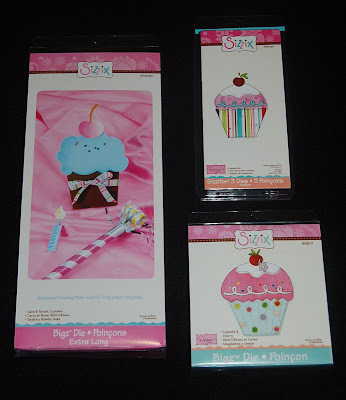 I was super excited when I saw that the new cupcake Sizzix die cutters had arrived at Ben Franklin Crafts. Of course I purchased all three of them....the large cupcake card, medium cupcake and small Sizzlet cupcake. At the same time I finally bought the monkey die cutter which I had debated about for a long time. Monkeys are so cute and this die matches many of my rubber stamps. I also just had to get the Dandelion Designs monkey with the gift and the words "A little something for you" because I knew they would work well on the card I was planning. The papers I used for these cards are from Doodlebug Designs (some of them are glittered). I chalked the monkey to make it more furry looking. The cupcake card with the heart brad was designed to be a party invitation. To cover the black paper behind the monkey eyes and nose, I cut out another head and glued it on but you could glue on a whole monkey and that would make the card even sturdier. 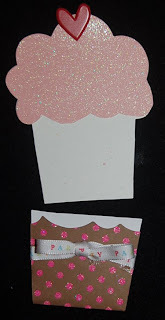 The cupcake card can be used to hold a gift card or money. I will be working on projects using the other cupcake dies and perhaps I will find the time to write up this monkey cupcake card project and put the instructions on our craft club website (www.bfcraftclub.com). 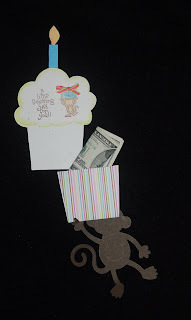 (Since the monkey cupcake card is rather large, I used a 12x12 sheet of scrapbook paper to make an envelope.) Oh, don't forget this weekend is the time to use your 40% off coupon at Ben Franklin Crafts! Yes, it's been awhile since I last posted a blog entry. We flew all the way to Boston and boy, are my arms tired.....old joke! While in Boston I stopped at Faneuil Hall marketplace to eat and shop. Many years ago in B.K. (before kids) I discovered an outdoor cart selling rubberstamps in the same marketplace. That's where and when my obsession with rubberstamps truly took off. The maker of the rubberstamps was a small business called Inkadinkado. I still know which stamps I bought all those years ago.....a rabbit with a box of hearts and a bubble gum machine dispensing hearts. Anyway, the cart was not there anymore but I did find Inkadinkado clear stamp sets selling in a Boston craft store. I'm hoping to convince our Ben Franklin Crafts buyers to start ordering Inkadinkado rubber stamps again. Their new clear stamp sets are attractive and reasonably priced. One of the clear stamp sets that I purchased was one with lots of animals/people saying funny birthday greetings. Since my sons are good humored and have birthdays coming up, I created the card in the photo. (I'm not sure which son will receive this card.) The blank card with the numbers is from a box set of 70 cards that I bought at Ben Franklin Crafts. Hanging the tag from the ribbon gives the card some movement. 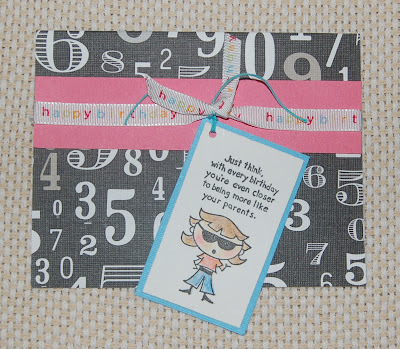 Embellishments could be added to the tag or ribbon to dress up the card and perhaps make it more suitable for a girl. Well, I'll start crafting and blogging more now that I've recovered from flying. Thanks for stopping by.